This 68% Bolivian cacao bar is a bit of a conundrum to me. 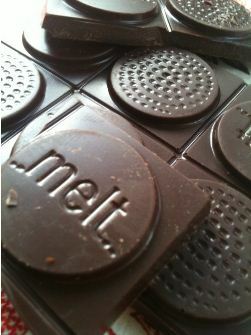 It is interesting to me that both this and the Felchlin cacao is 68% and I don’t know that Melt is a bean to bar company. I do think that Felchlin is an amazing chocolate supplier and I hope they continue doing their amazing work with cacao, supplying rare and amazing chocolate to chocolatiers all around the UK. A little more of this, with a little less of the cheap stuff and we will not only have the world’s best chocolate industry but we’ll also ensure we buy chocolate that promoted diversity and investment in rarer breeds. Bolivia is not the easiest place to get your chocolate from. Not only are these beans smaller, they are more difficult to access according to those I have spoken to in person. The more of this chocolate we buy, the more likely they are to treat the trees well and hopefully by only using a single middle man, the more money farmers will get. This particular bar is weirdly a bit sweet for me. At 68% I didn’t expect it to be harshly dark but it is sweeter than I expected. I also didn’t get the fruit notes I had assumed I would. I did get a strong chocolate flavour with little acidity but just a hint. 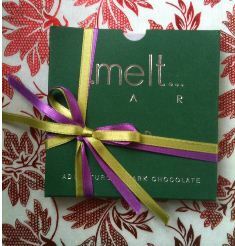 I didn’t really get lemon or liquorice though I did get a touch of molasses and I didn’t feel it was too woody so I guess I got a different profile from what the folk at Melt found. I did get prunes and dried dark fruit which is different from what is described on the box but it could be because I tried it in the afternoon. All in all though, I like this bar as a sweeter dark chocolate bar. This is a bar that will convert milk chocolate lovers to the dark side. Being a cacao with such a varied history and with government intervention putting the wild strains at risk, it would be god to see this delicious chocolate survive and thrive in its current for – without the government trying to control things.